THE Bolzoni Auramo ETX-G3S series of intelligent carton clamps ensures safe, quick and easy handling operations. Available from Eurolift , the ETX-G3S series has been designed for safe and damage-free handling with the most common application fields in the high-volume carton boxes and white goods handling. The series uses an advanced sensor technology that identifies the number of units, the load dimensions and configuration consequently selecting the initial working pressure. The load identification system includes opening sensors to identify the number of units wide, slip sensors to identify the number of units deep and infrared sensors to identify the number of units high. The slip sensors located on the contact pads detect any load slippage at the lowest level and send the information to the control unit. The control unit also instructs a proportional valve to increase the hydraulic pressure in the clamping cylinder and consequently the clamping force between the arms with an instantaneous reaction time. * Total automatic clamping force control. * Effective and accurate clamping control. * Minimises clamping force during all handling. * Instantaneous clamping force increase upon dynamic load situations. * Fully computerised control system with an internal CAN-bus. * Automatic clamp positioning control. * Automatic real-time sensor diagnostics. 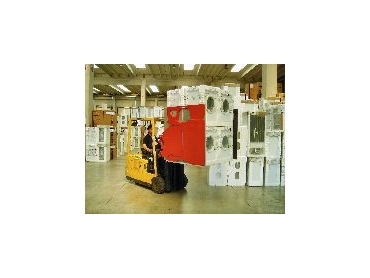 The clamp operates in a similar way as a conventional carton clamp whereby the forklift driver controls the opening and closing of the clamps and the load lifting during all handling conditions. Compared to a conventional clamp however the intelligent carton clamp is able to control and automatically adjust the pressure in the clamping cylinders after the forklift driver has clamped and lifted the load. The control unit indicates to the driver the operational status of the clamp. Any load movement is detected by slip sensors which send information to the controller unit.